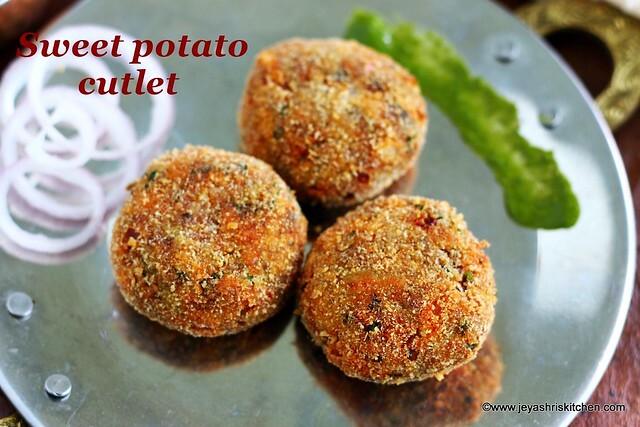 Sweet potato cutlet | sakkara valli kizhangu cutlet recipe with video and step by step pictures. Cutlets are always loved by everyone at my place. Though i make it rarely,but whenever i make, i make Potato cutlet only. 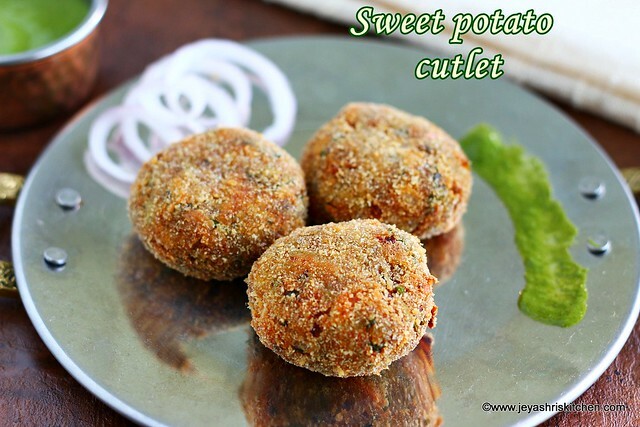 Last year, when i posted sweet potato chaat itself, i planned to post the sweet potato cutlet recipe. Finally i tried sweet potato cutlet today and i loved it very much. The sweetness of the potato with the flavor of the spices added, complimented the cutlet so well. I am sure this is a perfect tea time snack for a rainy day evening, along with a cup of hot ginger tea. Generally sweet potato cutlet is made during fasting days. But i didn't make it as a no onion no garlic version. Boil the sweet potato in pressure cooker for 4 whistles. Let this coo nicely. Once done take it out form the water immediately. Else it will absorb more moisture. Keep this in the refrigerator till you use this for sweet potato cutlets. Finely chop the cashew nuts, coriander leaves,mint leaves and onion. In a wide bowl add the sweet potato. Mash this finely using a potato masher or a fork. Alternatively you can grate the sweet potato and add too. Add the red chili powder,salt,onion,coriander leaves, mint leaves, 1 tsp pepper powder,cashew nuts, garam masala, green chili (if adding) and the plain flour (or millet flour). Mix this well using a clean hands. It will come like a dough. In a deep bowl add the corn flour, chaat masala and 1 tsp pepper powder. Add water and make it into a thin watery paste. This is just to coast the patties. Keep the bread crumbs ready in a plate. Grease your hands with oil. Take a big lemon sized ball of sweet potato mixture and make it into a round ball. Flatten this and make it into a patty. You can make oblong shape too. Dip the sweet potato patty in the corn flour water and immediately roll them on the bread crumbs. Arrange this in a plate. Repeat this for the rest of the sweet potato mixture. If you want to make it later cover it with a aluminium foil or cling wrap and keep it inside the refrigerator. You can even fry the next day too. Heat oil in a pan, when it is hot, bring the flame to medium. Slowly put the cutlets into the pan. Cook the cutlets in medium flame on both sides. Repeat this for the remaining cutlets. Boil the sweet potato in pressure cooker for 4 whistles. Let this cook nicely. Ensure that the sweet potato mixture is firm, else it will be disintegrate in oil. As sweet potato is bit sweeter, the red chili powder will be perfect enough to balance the taste. You can use cookie cutters to shape the sweet potato cutlets. What can I use instead of Bread crumbs? Coarsely powdered oats can be added.